The historical center of Havana, Old Havana (Habana Vieja), is located near all major tourist sights such as Plaza de la Catedral, Plaza de Armas, Plaza de San Francisco, Plaza Vieja, Calle Obispo, Capitolio Nacional, Museo Nacional de Bellas Artes, Museo de la Revolución and Hemingway's two favorite bars, La Bodeguita del Medio and the Floridita. Excellent location in Old Havana (Habana Vieja), the historical center of Havana, declared World Heritage Site by UNESCO. Surrounding the house are the Plaza de la Catedral, Plaza de Armas, Plaza Vieja and others among the main attractions of Havana, among which several museums, and Hemingway's two favorite bars, La Bodeguita del Medio and the Floridita. Are available for the guests of this apartment: 3 double bedrooms with private bathroom; dining room, kitchen, terrace, a large lounge and a small lounge. All rooms have air conditioning, refrigerator, telephone, electricity at 110 and 220 volts and safe. CD player and hair dryer are optional. The guest rooms are connected to the rest of the house through an external passage, which ensures the privacy of the guests. This passage also connects the rooms to kitchen and dining room. Beside the kitchen there is a staircase that leads to a pleasant terrace offering a beautiful view of Habana Vieja. The owner Mr. Emilio is very nice and friendly and you can ask him any questions about your stay in Cuba. Daily cleaning, all utilities and local phone calls are included in the price. 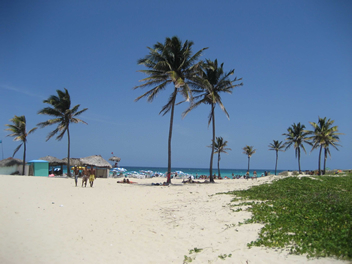 A laundry service and meals of Cuban and international cuisine are offered at cheap prices upon request. The price of the meals is of 10 CUC for lunch or dinner and of 3 CUC for breakfast. Excellent location in Old Havana (Habana Vieja), the historical center of Havana, declared World Heritage Site by UNESCO. Surrounding the house are the Plaza de la Catedral, Plaza de Armas, Plaza Vieja and others among the main attractions of Havana, among which several museums, and Hemingway's two favorite bars, La Bodeguita del Medio and the Floridita. Are available for the guests of this apartment: 3 bedrooms - 1 double, 1 twin and 1 single, each with private bathroom. In the apartment are also available: dining room, kitchen and balcony. All rooms have air conditioning.The owner Mrs. Nancy is very nice and friendly and you can ask her any questions about your stay in Cuba. Daily cleaning, change of sheets and towels three times a week, all utilities and local phone calls are included in the price. Excellent location on the seventh floor of a majestic building in the heart of Old Havana (Habana Vieja), the historical center of Havana, declared World Heritage Site by UNESCO. A few steps away are La Bodeguita del Medio, El Floridita, El Café del Baturro, El Bar Montserrat, Museo de Bellas Artes, Museo de la Revolución and others of the main attractions of Havana. 2 bedrooms are available for the guests of this apartment: 1 double and 1 twin bedroom, each with private bathroom. In the apartment dining room and kitchen are also available. All rooms have air conditioning and fan. From both rooms you can enjoy a beautiful view of the historical center of Havana. The owner Mrs. Alina is very nice and friendly and you can ask her any questions about your stay in Cuba. Cleaning, change of sheets and towels three times a week, all utilities and local phone calls are included in the price. A laundry service and the preparation of meals of high quality, including cakes of the Creole cuisine, are offered at cheap prices. Excellent location on the eigth floor of a majestic building in the heart of Old Havana (Habana Vieja), the historical center of Havana, declared World Heritage Site by UNESCO. A few steps away are La Bodeguita del Medio, El Floridita, El Café del Baturro, El Bar Montserrat, Museo de Bellas Artes, Museo de la Revolución and others of the main attractions of Havana. Are available for the guests of this apartment: 2 double bedrooms sharing one bathroom and one independent kitchen/dining room. 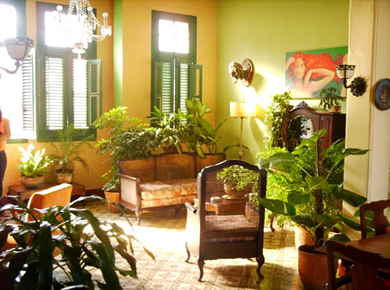 The apartment also has a terrace offering beautiful views of the historical center of Havana. 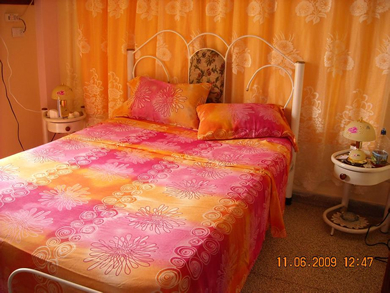 The room has air conditioning and a fan.The owner Mrs. Ofelia is very nice and friendly and you can ask her any questions about your stay in Cuba.Cleaning, change of sheets and towels three times a week, all utilities and local phone calls are included in the price. The preparation of meals is offered at cheap prices upon request. Excellent location in Old Havana (Habana Vieja), the historical center of Havana, declared World Heritage Site by UNESCO. Surrounding the house are the Plaza de la Catedral, Plaza de Armas, Plaza Vieja and others among the main attractions of Havana, among which several museums, and Hemingway's two favorite bars, La Bodeguita del Medio and the Floridita. Independent apartment consisting of 1 bedroom with one double and one single bed, dining room, kitchen and bathroom. The apartment also owns a balcony offering beautiful views of the historical center of Havana. The bedroom has air conditioning.Cleaning, change of sheets and towels three times a week, all utilities and local phone calls are included in the price.